Fantastic Worlds of Burroughs and Kline #1, mid-'60s, published by Philip J. Currie. Reprinted in Boreal Bulletin #2, 1968/03, published by William Silvester. 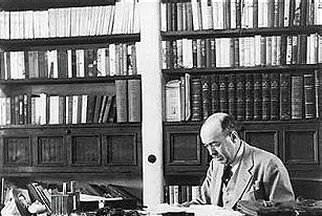 Edgar Rice Burroughs wrote of many countries and several worlds, ranging from the mythical Kingdom of Lutha in southeast Europe to far off Poloda in the star-system of Omos. At the same time his numerous Earth-born characters were representative of almost every nation on the face of the globe – Abyassinians, Belgians, Chinese, and on down the alphabet. Just what part did Canada and Canadians play in the tales of this master story-teller? To answer the second part first, there are only three Canadians thus honoured, and they by their works alone. 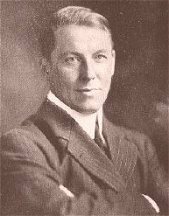 The first is Henry Herbert Knibbs, for his poem “Out There Somewhere” which was used as a basis for Part II of the The Mucker and for brief selections scattered throughout the The Oakdale Affair. Quotations from the works of Robert W. Service also appear in these two books, thanks to Bridge and his fondness of this style of verse. The name Mary Pickford, Toronto-born star of the silver screen, will be found in The Girl From Hollywood. As for Canada herself, there is a strong possibility that John Carter roamed southern Saskatchewan and Manitoba, as in A Princess of Mars he says he spent several years among the Sioux of the north. In the early days of American history these Indians ranged through what is now Minnesota, the Dakotas and the Prairie Provinces. As far as we know, Tarzan did not visit Canada, never getting nearer than the northern part of Wisconsin (Tarzan of the Apes). However, in Tarzan the Magnificent (Chapter 19) mention is made of Medicine Hat (Alberta), in Tarzan and the “Foreign Legion” (Chapter 5) reference is made of Halifax (Nova Scotia), while in Tarzan and the Madman (Chapter 15) the unfortunate Pelham Dutton said he had done a lot of mountain climbing in northeast Canada. In The Mucker, Bridge mentions having been “on the Yukon” (River). While this could have been somewhere in Alaska, it also is quite possible that he was in the Canadian Yukon as well, for the river flows through both areas. In the opening remarks of The War Chief we are told that Apaches from Northwest Canada migrated to Arizona and New Mexico centuries ago. Thus it was that Canada had a direct, though remote, hand in the raising of young Andy MacDuff, or Shoz-Dijiji as his foster-folk called him. In Beyond Thirty (Chapter 11) Jefferson Turck, commander of the ill-fated aero-submarine ‘Coldwater’ tried to make the port of St. John’s (Newfoundland) when his ship generators broke down well over the Atlantic. Canada, by that time known as the Federated States of Canada, was part of the relatively new Pan American Federation. In Chapter 2 of Pellucidar we read, “gaunt, lean wolves – huge creatures twice the size of our Canadian timber-wolves.” (Our thanks to John Harwood for this paragraph). The most important reference to Canada, however, will be found in The Moon Maid. In the prologue the narrator is on an aircraft enroute from Chicago to Paris. This in all likelihood, would take him over Eastern Canada. 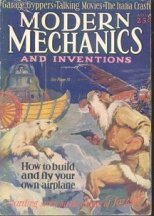 But in the little known prologue to Part II (see The Moon Men, Ace Edition) we are told that Burroughs himself went out hunting for polar bears on that portion of the Canadian mainland in the vicinity of Herschel Island. With him were three (presumably Canadian) Eskimos. Burroughs became separated from his party and was attacked by the very bear he was hunting. He, in turn, was rescued by the crew of the International Peace Cruiser. On board the cruiser was Julian 3rd, Admiral of the Fleet, who was ranging over the Canadian Northland in an effort to locate Burroughs at the request of his president. 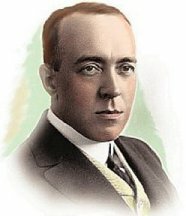 It is to be presumed that the entire tale of Julian 9th was related high in the air over Canada while the ship was returning from Herschel island to Washington.Thus it is that Canada and Canadians play a part — however small — in the works of Edgar Rice Burroughs. Beneath the jungle's bright moonlight? And brought swift Bara to his knees? That phantom of the jungle broad. While ebon warriors plan attack. Of ambush hid around the bend. Captured, and tortured at the stake. Then Numa roars - and you awake. Click on the numbers to go to the appropriate pictures in the Gallery section. Click on the other links to go to related stories in the ERBzine site. 2. 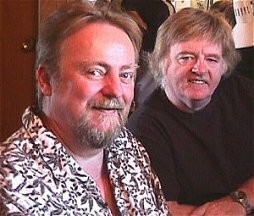 As reported in the ERBzine artist tribute, Russ Manning's father was Canadian. 3. 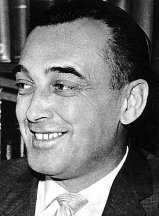 One of the all-time great ERB scholars is the late John F. Roy. 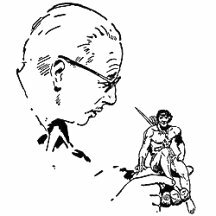 Many of Mr. Roy's contributions listed in our Illustrated ERB-dom Bibliography. 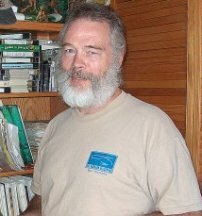 He was a longtime contributor and co-editor of this award-winning ERB fanzine. 4. 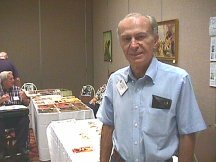 Doug Denby of Unionville, Ontario -- host of ECOF 2005 -- is John F. Roy's nephew. 5. The H. H. Knibbs Tributes are featured in ERBzine 0950 and ERBzine 0951. 6. There were a good number of Canadian authors in ERB's personal library. 7. Many of the Canadian McClelland & Stewart 1st editions are prized collectors items. 8. Brendan Fraser was star of the Tarzan parody film, George of the Jungle, and host for the AMC Tarzan marathon. 9. Actually the previous two references along with Hal Foster made up one of the TRI-via questions in our ERB board game. 10. Among the guests Ed partied with in Australia on January 3, 1943 was Ralph E. Smith, a Canadian government official from Vancouver, BC. 11. And of course, the Ratnaz Files parody serial is teeming with Canadians. 12. Another well-known SF writer, A .E. van Vogt, was born and lived close to our Manitoba home when I was a kid. 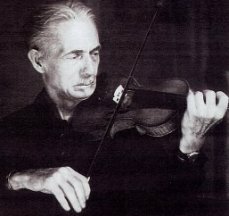 (Alfred Elton Van Vogt ~ born in Winnipeg, Manitoba, 26 April 1912 - died 26 January 2000). I regret never having met him. 13. ERBzine readers might be interested in knowing that the current ERBzine prolific contributor, Nova Scotia-born Den Valdron, is also a Manitoba Neighbour. 14. Another longtime ERBapa contributor and well-known collector of ERB and original art, Raymond Cuthbert is also a Manitoba neighbour who lives in Winnipeg. 15. There have been numerous other Canadian ERBapa contributors over the years including BC's Nels Myrhoj. 16. Alberta artist Jeff Doten's Illustration Studio Website features a fine array of Mars and SF art. Jeff has also designed logos for numerous ERB Conventions. 17. In his ERBzine analysis of The Land That Time Forgot, ERB scholar Phillip R. Burger writes: "Another possible inspiration for LTTF's plot (and I have no proof except it simply sounds too intriguing to not mention) is the sinking of the Canadian cargo ship Mount Temple by a U-boat in 1916; the cargo the ship carried was dinosaur bones from Alberta." 18. 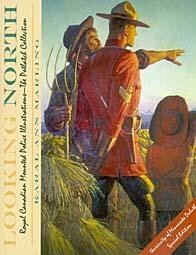 Some of ERB nephew Studley Oldham Burroughs most famous illustrations were of the RCMP: See: Looking North: Royal Canadian Mounted Police Illustrations: Potlatch Collection. 19. There is an interesting list of Canadians associated with SF in an ERBzine Motes & Quotes issue at 0662. 21. 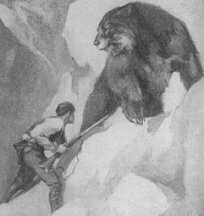 A Canadian reference by ERB in Pellucidar: "There were the great cave bears in the timber, and gaunt, lean wolves--huge creatures twice the size of our Canadian timber-wolves." 22. One of the many unreported trips taken by Ed and Florence in the late '30s was aboard the Canadian Pacific Railway ship: The Empress of Japan. This trip is described in the Florence Gilbert biography in ERBzine. It included a cruise through the Panama Canal to New York. They then drove cross-country back to Los Angeles in the new Packard that had been stowed on the liner. In August of 1938 Ed and Florence sailed to Honolulu on the S.S. Lurline for a planned two-week visit with Wayne and Mary Pflueger -- he was to dedicate a book to Mrs. Pflueger a few years later. They returned on The Empress of Japan, arriving in Vancouver in October. They then drove down to Tarzana along the Pacific coast. Coincidentally, my father, CPO Jerry Hillman of the RCN served on what had been a rival ship operated by the rival railway company, Canadian National Railway. H.M.C.S. Prince Robert was refitted a number of times and by the end of WWII it was a state-of-the art cruiser. It sailed with a British and US convoy to the Pacific where the oversaw the release of the Candian POW as Hong Kong and accepted the Japanese surrender. 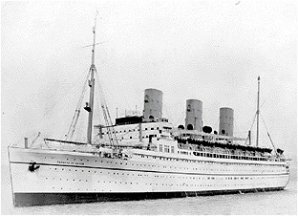 In its long history the ship was originally designed as a fast coastal ferry, she later became a cruise ship, an AMC, an A/A cruiser, -- and then after the war a refugee transport, and eventually cut in half and lengthened to serve as a luxurious ocean liner -- finally it was sold to Mexico and then scrapped. 23. Dr. Philip Currie, a driving force in the success of Alberta's famous Royal Tyrell Museum, where he is currently head of Dinosaur Research, published two excellent ERB fanzines in the '60s and '70s: Fantastic Worlds of Burroughs and Kline and ERBIVORE. 24. 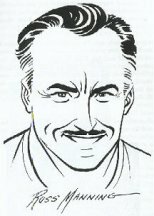 Pete Ogden, who is still editing the longest-running ERB fanzine, ERBANIA, published the first issues back in the '50s while residing in Canada. 25. Steve Hawkes (Sipek) immigrated to Canada in 1959 where he learned and eventually won 1st place in a Mr. Canada contest. He became a long distance swimmer and swam Lake Ontario in the mid-'60s. He then starred as Tarzan in two unauthorized Tarzan movies: Tarzan en la gruta del oro in 1969, also known as King of the Jungle and in 1971, Tarzan Y El Arco Iris or Tarzan and the Brown Prince. During the filming of the second movie he was burned over 90% of his body. 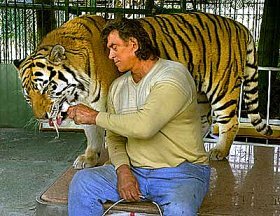 A lion on the set dragged him to safety and from that time on he had an overwhelming love of animals -- eventually opening a wild animal park in Florida in which he provided sanctuary for mistreated tigers, lions, leopards, cougars, etc. 26. Quotations from the works of Robert W. Service, one of ERB's favourite poets, appear throughout ERB's books The Mucker and The Oakdale Affair. 27. Mary Pickford, Toronto-born star of the silver screen, is mentioned in The Girl From Hollywood. ERB's second wife, Florence Gilbert, was a Mary Pickford look-alike and came to Hollywood at the personal encouragement of Miss Pickford. Pickford actually came out to Tarzana Ranch to look over the property on January 20, 1930. 28. In Beyond Thirty the ill-fated aero-submarine Coldwater tried to make the port of St. John’s, Newfoundland when the generators broke down over the Atlantic. 29. In the original prologue to Part II of the Moon Maid Burroughs himself went out hunting for polar bears in the vicinity of Canada's Herschel Island. With him were three Eskimos. 30. ERB also has a major Canadian Internet connection. 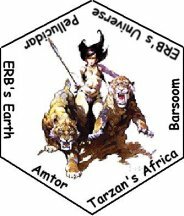 The Official Edgar Rice Burroughs, Inc. Websites and Webzines see joint publication from Brandon, Manitoba and Tarzana, California: www.tarzan.com ~ www.tarzan.org ~ www.JohnColemanBurroughs.com ~ www.ERBzine.com ~ and the soon-to-be-launched Barsoom and Danton Burroughs sites. 8. Brendan Fraser "George of the Jungle"
Edgar Rice Burroughs (1875-1950) was the creator of the famous jungle character, Tarzan of the Apes. Burroughs wrote twenty-six books extolling the virtues of the apeman, and from these have sprung over forty motion pictures, several radio and TV series, and countless comics books, as well as daily strips and Sunday features. Some of his books, as well as daily strips and Sunday features. Some of his books have been translated into as many as thirty foreign languages. As well as the Tarzan novels Burroughs wrote eleven tales of adventure on the planet Mars, five on Venus, and seven in Pellucidar, a land in the centre of the Earth. To this add another dozen science-fiction, jungle, historical romance, and western stories and you have over sixty titles by one of America's most popular authors. Burroughs' U.S. first editions are always in demand . . . but the same desire doesn't seem to exist for foreign editions, including the few titles published in Canada. Unfortunately not too much is known about the Canadian firsts. To my knowledge only seven have been accounted for, six of them in the Tarzan series. McClelland, Goodchild & Stewart, Toronto, was responsible for TARZAN OF THE APES in 1914, THE RETURN OF TARZAN in 1915 and THE BEASTS OF TARZAN in 1916. Oddly enough, while the M.G.&S. name appears on the title page of these books the imprint on the spine is that of A.C. McClurg & Co., the American publisher of Burroughs' books up to 1928. Book four, THE SON OF TARZAN, was distributed in Canada in 1917 by The British Columbia News Co. Ltd., Vancouver and The Toronto News Co., Toronto. One or the other of these companies is identified on the title page but the spine is blank in this respect. I have no record of a Canadian edition of TARZAN AND THE JEWELS OF OPAR (U.S. 1918) or of JUNGLE TALES OF TARZAN (U.S. 1919). In 1920 McClelland & Stewart Ltd., published TARZAN THE UNTAMED and in 1921 TARZAN THE TERRIBLE. These two books show the M&S imprint on the spine as well as on the title page. 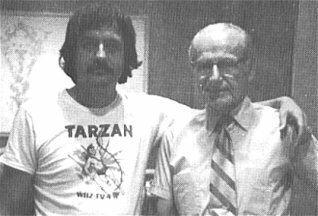 As far as I have been able to establish no further Tarzan books were published in Canada. George J. McLeod, Ltd. of Toronto was the Canadian distributor for Edgar Rice Burroughs, Inc., between 1934 and 1940, but whether or not this firm's name appeared anywhere in or on the books they handled is not known. Inquiries have show their records to not go back that far. I have a copy of Burroughs' adventure novel THE MUCKER, which was published by M.&S. in 1921, and this firm's name appears on both the title page and the spine. I also have a copy of the 1925 agreement between A.C. McClurg & Co. of Chicago and E.R.B. covering his story THE CAVE GIRL, wherein mention is made of "royalties on the Canadian edition", but I have neither seen nor heard of such a publication. In review - it would appear that a Canadian edition of an Edgar Rice Burroughs book would show the name of the Canadian publisher on the title page, but that the spine may bear the name of that publisher or of the American firm, A.C. McClurg & Co. or none at all. If there were any other Edgar Rice Burroughs titles published in Canada I would be most happy to hear of them. 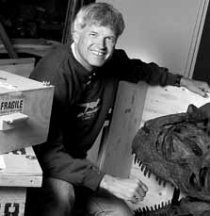 Calgary - Foremost dinosaur expert, Phil Currie, says the discovery of a "hidden dragon" ancestor to the mighty tyrannosaurus rex sheds new light on the history of prehistoric creatures. The new species found in the badlands of northwestern China lived around 160 million years ago in the Jurassic period -- making it more than twice as old as T. rex. Most Jurassic fossils have been found in the Americas and this discovery helps solve the mystery of how the tyrannosaurs came to dominate the predatory landscape, said Phil Currie, one of the world's leading paleontologists and an expert on meat-eating dinosaurs. "We wondered for a long time where are they coming from," said Currie, who spent two years excavating fossils in the Gobi Desert in the 1980s near where the latest finds were discovered. "They sort of come out of left field in a sense and just take over roughly 100 million years ago," said Currie, Canada Research Chair in Dinosaur Paleobiology at the University of Alberta in Edmonton. "Now we can see they were already in Asia towards the end of the Jurassic period and that's obviously the spawning ground for these animals." The findings, gleaned from the skeletons of two dinosaurs discovered in a 2002 expedition, are outlined in today's edition of the journal Nature. The beast has been named Guanlong wucaii, which means "crowned dragon from the five colours." The name refers to a huge nasal crest in the centre of the creature's head and the many colours of rocks found in the region of China where the skeletons were found. That narrow, largely hollow head ornament was the biggest surprise to researchers who found the dinosaur. While other dinosaurs have had similar features, this one was unusually large and elaborate for a two-legged meat eater. . . . Nobody knows its purpose but it was probably some kind of display to other members of its own species. . . . The two-legged meat-eater was far smaller than T. rex, measuring just three metres from its snout to the tip of its tail. It had relatively long, three-fingered arms, rather than the two-fingered stubby arms that most people associate wit the most fearsome of predators.